The Orlando Weekly "Best of Orlando" poll is active through June 27th. I of course hope you will vote for Analog Artist Digital World as the Best Local Blog. They ask for a name and address, but that wasn't a big deal. You have to vote in at least 15 categories, and you can't use the same answer in more than 5 categories. The list is dauntingly large, so I am writing down my votes in this blog post to help you get a jump start. Most of my votes go to places I have sketched. 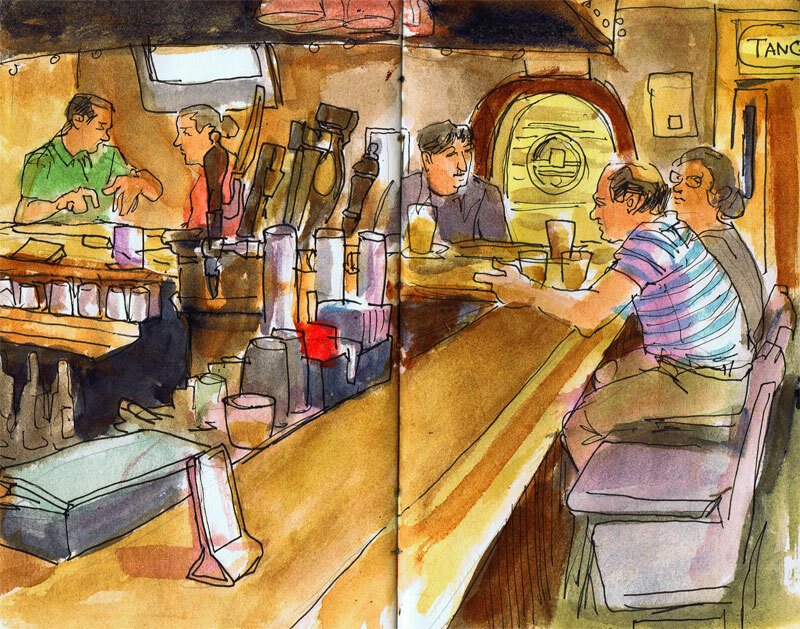 The sketch above was done in Tanquerey's, which got my vote as the best local dive bar. If I left out any notable local establishments, then please leave me a comment. You can vote from anywhere in the world, and encourage your friends to vote. The following list is not all inclusive, it is just intended as a jump start. Of course your tastes might vary. Best Mural...........................Who's Line is it Anyway? Don't know about the rest,but I can vouch for the excellence of Jubals Kin.